Snohomish County, Wash. – On Friday, Jan, 11 at 10 p.m., the Alaskan Way Viaduct in Seattle will permanently close. This sets the stage for potential service delays into and out of Seattle when the next work week starts on Monday, Jan. 14. The viaduct closure will result in more traffic on I-5 and downtown Seattle streets for three weeks, until the new Battery Street Tunnel opens. 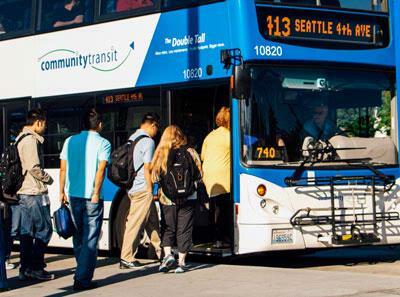 Community Transit anticipates that buses on its 13 routes to downtown Seattle and six routes to the University of Washington will be more crowded than usual, and may get delayed in traffic. The agency will monitor real-time service impacts, and engage in “active dispatching” based on need. This may involve sending drivers out earlier to ensure their first trip starts on time, reassigning buses to serve routes that are experiencing longer delays, and assigning extra buses to serve express routes that might serve one location where a line of passengers are waiting. • Consider not traveling to Seattle if you don’t have to. Telecommute, if that is an option. • Flex your work schedule to avoid peak commuting times. • Use our online trip planner or call Customer Care at (425) 353-7433 to get the best trip options. • Try to plan a trip from your home. Local buses can take you to a transit center where you can catch a direct bus to Seattle. • Consider taking Route 413 from north Lynnwood. That route has 13 off-peak trips that serve Swamp Creek Park &Ride where there is available parking. • Try carpooling with co-workers. This may be a great time to look into our Vanpool Program. Bus schedules, a trip planner, and rider alerts are available at www.communitytransit.org. Follow @MyCommTrans on Twitter for updates on traffic and service delays.